Surprise, surprise: Nimbus Data is supplying 50TB flash drive tech to SSD OEMs like Viking and SMART Modular Technologies. Nimbus Data went through an interesting period of dissatisfied customers and lawsuits for its flash arrays, and contracted in size before moving from San Francisco to the Los Angeles area in January last year, indicating it had new products coming. It announced an ExaFlash array in August 2016. Now here comes this ExaDrive technology, validated and used by both Viking, a division of Sanmina Corporation, and SMART Modular Technologies. 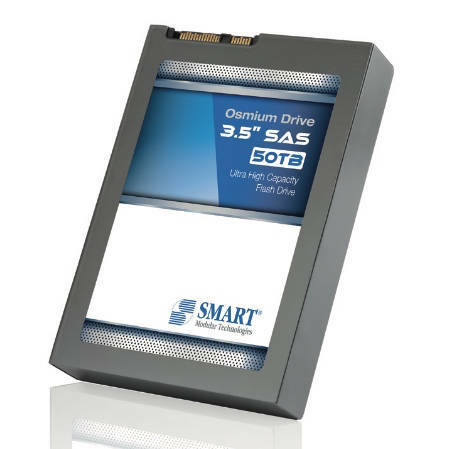 Viking's UHC-Silo SSD comes in a 3.5-inch form factor and uses the Nimbus DataExaDrive technology. It comes in, to be precise, 22.9TB and 45.8TB capacities. SMART Modular Technologies, with its 25TB and 50TB Osmium drives, is another ExaDrive OEM. ExaDrive is claimed to have the lowest energy consumption per terabyte of any SSD, and that has been independently tested. Dennis Martin, president of analyst firm Demartek, stated: "ExaDrive is by far the largest capacity single drive that Demartek has ever tested, either HDD or SSD. With a standard 3.5-inch form factor and SAS interface, the drive was plug-and-play in our 12Gbit/s SAS JBOD and came online immediately. "Our Iometer tests found that the 50TB ExaDrive-powered SAS SSD performed in line with Nimbus Data's claims, consuming between 14.5 and 16.5 watts under various read and write workloads and a mere 7 watts at idle." Nimbus Data founder and CEO Thomas Isakovich says ExaDrive-powered SSDs offer 5x the capacity of [10TB] nearline HDDs in the same size and power budget, enabling a 5:1 reduction in rack space and power per terabyte. He said: "ExaDrive's software-defined architecture will enable SSDs as large as 500 TB by the year 2020, achieving up to 600 petabytes in a single rack." KIWICON Open sourced 'Little Doctor' vaporises chat apps, but Rocket Chat, Ryver patched.